A new species of butterfly discovered by a teacher and environmentalist Punyo Chada in September 2010 in the Tale valley has been named after the Apatani tribe of Arunahcal Pradesh. The decision to name it after the Apatani Tribe was taken yesterday during the Northeast Butterfly Meet held in Ziro. This 4 day meet, organised by The Butterflies of Northeast group with Nugun Ziro’s assistance, started from 16th September, 2016 in Ziro which is situated in the lower Subansari district of Arunachal Pradesh. This is the first time that a species of butterfly has been named after the tribe. 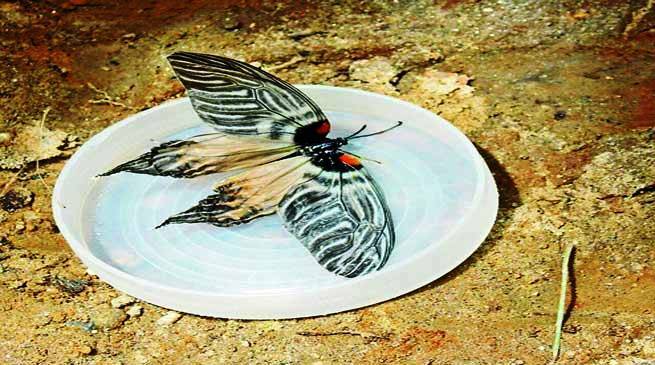 Renowned lepidopterist Mansoon Jyoti Gogoi, who took part in the meet, said that the common name of this new species has been decided as “Apatani Glory” but it will take three months to decide the scientific name of this species. Although not confirming anything, he did hint that the scientific name will be derived from Punyo Chada, the person who first discovered and reported the existence of this species. Ziro is the home of the Apatani tribe, one of the largest indigenous communities in the Himalayas. Apatanis have a unique way of living which emphasizes on sustainable utilisation of land and other natural resources. Situated 12 kms from Ziro is the Tale valley where this new species of butterfly was discovered. This is also where the butterfly species commonly known as “Bhutan Glory” was first discovered. The Northeast Butterfly meet was marked by the presence of 46 participants from various states like Arunachal Pradesh, Assam, Karnataka, Kerala, Sikkim and West Bengal. In addition to the Indian participants, the Hong Kong lepidopterist society also participated in the event. The purpose of this event was to gather lepidopterists, wildlife officials and wildlife conservationalists to discuss their ideas and experiences in the field of wildlife conservation with emphasis on butterflies.